Back in December I was invited to Des’ inaugural big game in his new shed-o-war, that I haven’t posted about it yet has been bugging me so I’ll try and remember what happened to get something down at last. 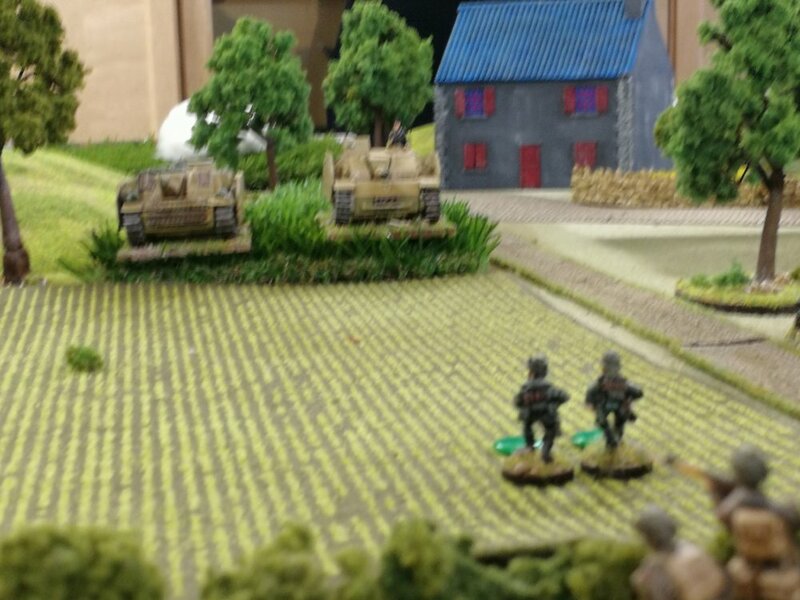 The game was a WW2 Normandy bash using I Ain’t Been Shot Mum by the Lardies and Des’ lovely 20mm collection. I was in charge of the Canadian forces (the first mistake made by our side!) and I was ably assisted by Andy and Daren. We were tasked with advancing and clearing the immediate area to our front of some nasty Bosche that were led by Des and Ian. After a quick ‘O’ group with the chaps we decided that Andy would take the dismounted infantry company through the fields along the left flank supported by the flail tank. I would be in charge of the recce detachments and would barrel up the road in the centre and scout the right flank; I was also in charge of the reserve of a tank squadron. Daren would take another tank squadron with a Kangaroo-mounted infantry platoon along the right and would react to what the scouts found. The idea was to keep things as simple as possible and hold on to the reserve until either one of the two flanking groups were in dire trouble or to exploit any success that they had. 12 feet of Norman countryside. We got lucky with our three pre-game Stonks setting fire to two of the buildings that we targeted, one of which being the church thus negating the use of its steeple to any Fritzy FOO’s, and Andy started things off by advancing down the left while the scouts cars nosed along the road in the centre and the right. 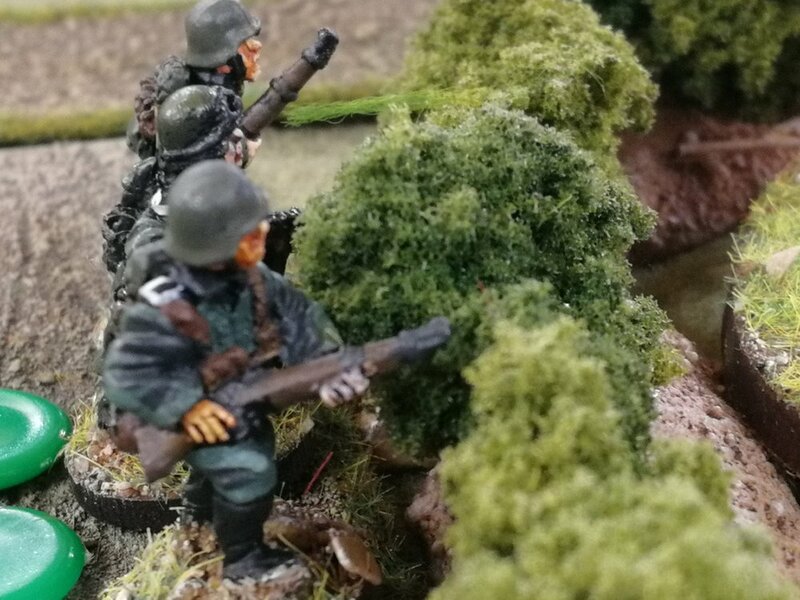 Andy’s lads were quickly engaged after running into some enemy infantry and a fierce fight swiftly ensued and pretty soon it looked like it was time for an assault to go in to clear some of the Germans out. As the reserve Sherman’s were not being let go from the reserve (their card was not coming up) to support the impending attack Andy chucked his attached Sherman Flail into the fray and mighty impressive looking it was too as it churned its way through the hedgerow where the enemy lay. Unfortunately the attack faltered due to some heroic defending by the Landseer (absolutely jammiest of jammy dice throw!) although they didn’t hang on too long afterwards and withdrew to the rear just as a couple of StuG’s opened up and dispatched the Flail. While this attack was going on Andy was keeping more infantry located by the burning farmhouse pinned down in a firefight with one of his platoons which let the Daimlers work their way gingerly down the road onto the flank of the dug-in defenders. Unfortunately one of the cars was taken out by a German anti-tank weapon fired by the infantry but the survivor managed to get round the flank and revenge was served by brassing them up. The Jerries didn’t like this much and they soon broke and the left flank was looking open for the reserve tanks to start moving through with only the StuG’s seemingly in the way. However, things weren’t going so well over on the right. The Daimlers creeping down the lanes spent quite a while nosing gingerly forwards expecting any moment to be on the receiving end of general German nastiness in the shape of a Panzerfaust or ‘schreck. When it did come it was more of a massive clang as one of the cars was hit by some high velocity 75mm from a Panther hiding in a stand of trees. The surviving car was in somewhat of a pickle as it was immobilised with the next shot so decided to have a go back with its 2pdr and a seemingly one sided duel ensued. What seemed like a futile gesture on behalf of the recce types ended up being one of those great gaming moments as the German gunner couldn’t land a hit whilst the Armoured Car kept on hitting the target eventually causing enough Shock to the Panther crew that it had to withdraw! The cheers of the watching Canadians were quickly silenced however when another Panther opened up knocking out the gallant Daimler: just not cricket really, but medals all round. While this was going on Daren had moved his armoured infantry up and they were cruelly ambushed by another German infantry platoon and pretty soon most of the Kangaroo’s were burning due to attention from the remaining Panther and Panzerfaustings, although some of the infantry survived to fight on. 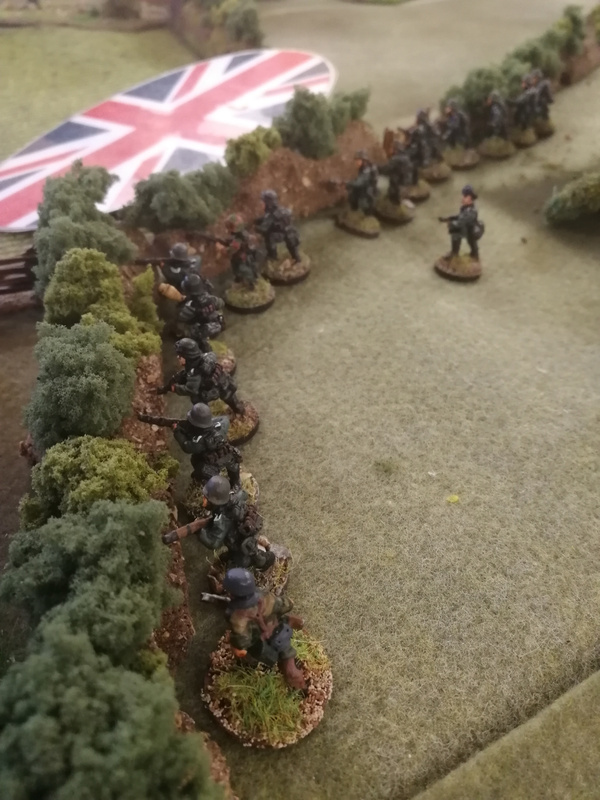 A terrific close range firefight then ensued across the hedgerow which the Allies finally won thanks to the HMG’s on the surviving APC’s which tipped the balance and finally saw the German footsloggers break. Unfortunately we still hadn’t managed to get any of our Sherman’s into action yet and were unable to as we had to stop due to time getting on. So at the end of play we had managed to break the initial line of resistance and force the German infantry to bug out but at no small loss to our own infantry and Armoured Cars, we still had two units of tanks that were uncommitted but still had a couple of Panthers and a couple of StuG’s to worry about and as we found out that the Germans also had a couple of Tigers lurking around the church we were sort of glad that we didn’t carry on as we didn’t fancy our chances much! We reckoned a draw was a fair result, we broke into their position but sort of got stuck doing so.